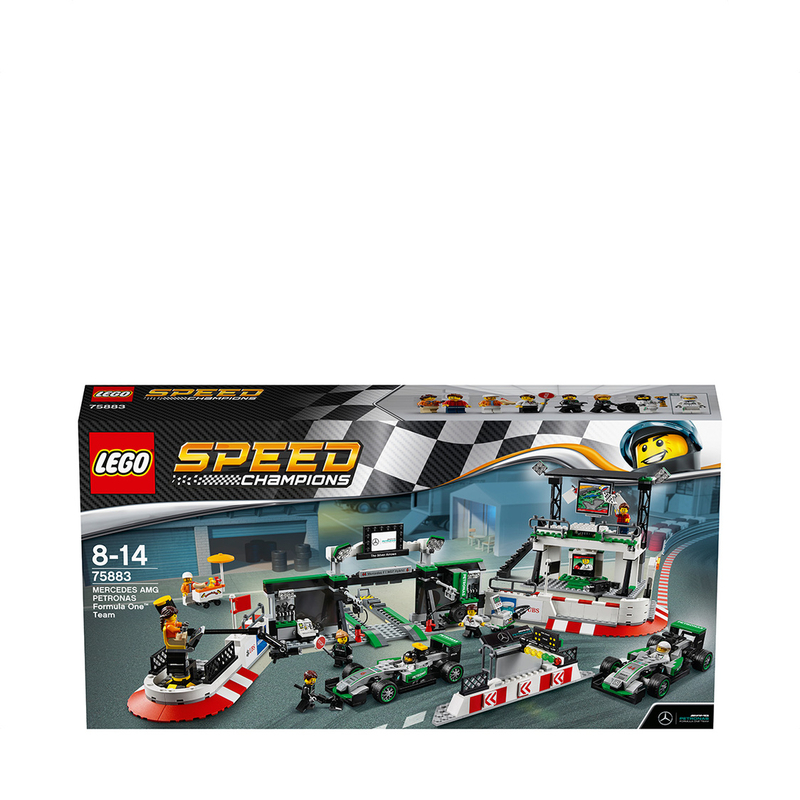 Test your skills as a driver, engineer, team manager—and even a TV cameraman—with this action-packed LEGO® Speed Champions MERCEDES AMG PETRONAS Formula One™ Team set. Operate the car jack in the garage and prepare the Mercedes F1 W07 Hybrid cars for the race. Jump in the cockpit and power away from the start-finish line. Monitor the cars' performance on the pit lane monitor. Adjust the camera arm to get a bird's eye view of the thrilling race action. When the race is over, rotate the big screen in the grandstand and reveal the victory podium. Lift the trophy… then go to the hot dog stand for a well-earned snack! 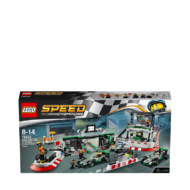 - Includes 8 minifigures: 2 MERCEDES AMG PETRONAS Formula One™ Team drivers, team manager, 2 engineers, hot dog vendor, cameraman and a race fan. - The MERCEDES AMG PETRONAS Formula One™ Team set features a grandstand, pit garage, pit wall, TV rig and 2 Mercedes F1 W07 Hybrid racing cars. - The pit garage includes a car jack function, 2 mounted computer screens with driver information and assorted elements, including a wheel jack, 2 spare wheels, 2 spare wheel caps, 5 wrenches, drill, oil can, hammer, ‘Stop' lollipop sign and a team logo. - The detailed pit wall includes a start-finish line with translucent green, orange and red light elements, plus a monitor and checkered flag elements. - The race-ready, buildable Mercedes F1 W07 Hybrid racing cars each feature a minifigure cockpit, wheels with rubber tires, authentic design details and race livery stickers. - Get a bird’s eye view of the race at the hairpin corner with the TV camera rig featuring an adjustable camera arm and camera-style element. - Watch the race with the race fan minifigure at the racing corner barrier with a high wall and doorway. - Also includes a hot dog stand with a parasol and hot dog element. - Accessory elements include 2 racing driver helmets. 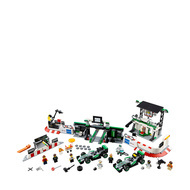 - This set offers an age-appropriate build and play experience for ages 8+. - Grandstand measures over 7” (20cm) high, 8” (21cm) wide and 3” (10cm) deep. - Pit garage measures over 5” (14cm) high, 11” (28cm) wide and 7” (18cm) deep. - Corner barrier measures over 2” (7cm) high, 8” (22cm) wide and 4” (12cm) deep. - Hairpin corner with camera rig measures over 3” (8cm) high, 3” (10cm) wide and 8” (22cm) deep. - Pit wall measures over 2” (7cm) high, 7” (19cm) wide and 1” (3cm) deep. - Mercedes F1 W07 Hybrid cars each measure over 1” (4cm) high, 5” (14cm) long and 2” (6cm) wide. - Hot dog stand measures over 2” (7cm) high, 1” (5cm) wide and 1” (3cm) deep.